You may hear elders griping about youngsters and their gadgets and gizmos, but the complaints won’t be coming from a certain group of residents at Atlantic Shores Retirement Community. Instead of feeling baffled by bytes and shaking their heads at smartphones, these senior citizens are embracing technology through the community’s newly-launched ASpire initiative, a project designed to use technology to enrich the lives of Atlantic Shores’ residents. The program allows residents to connect wirelessly within the 100-acre campus with virtually no IT knowledge required, fostering social and intellectual opportunities unrestrained by physical boundaries, and it bundles phone, TV and Internet services. Once fully integrated, Atlantic Shores will be among the first resident-governed cooperative model senior living communities in the country offering a campus-wide system encompassing multiple buildings and outdoor spaces. With it comes a corresponding mobile app where users can stay in touch, access community information, register for on-site activities and off-site excursions and access one-touch emergency dial to the Atlantic Shores gatehouse. To encourage residents to adopt these technologies, Atlantic Shores developed what may be the hippest clique in the community—the Hub Club, an energetic group of Atlantic Shores residents to ASpire to refine the functionality and direction of the community’s technology platforms and educate others to embrace them. Get more info at AtlanticShoresLiving.com. Chesapeake-based Volvo Penta of the Americas, a global manufacturer of engines for leisure boats, commercial vessels and industrial applications, is helping high school and college students get a leg up in the engine manufacturing industry. Last August Volvo Penta led a marine service technology competition at the prestigious SkillsUSA National Leadership and Skills Conference in Louisville, Kentucky, where more than 6,000 outstanding career and technical education students compete in hands-on contests in 100 different trade, technical and leadership fields. Throughout the year, the company nurtures young talent through its year-round internship programs geared to national and international college students with an interest in technical and non-technical careers in manufacturing. Interns serve in various company departments including engineering, aftermarket, sales, marketing and human resources. Learn more at VolvoPenta.com. Ever since the Escape Room craze swept Coastal Virginia, groups have giddily and willingly been (metaphorically) locked in rooms where individuals work together to solve clues and ultimately escape within an hour’s time—if they can figure out how. Now there’s another escape that’s unique to Coastal Virginia—Escape Ship: Captain’s Challenge. Here’s the scenario: it’s 1945 onboard the Battleship Wisconsin. Teammates are locked inside the Captain’s Cabin and have exactly one hour to save the day. Participants must solve problems, find clues and decipher codes before it’s too late. It’s the only escape room ever developed on a battleship, and it’s an excellent teambuilding exercise to bring coworkers together for some stress-free fun (well, maybe not stress-free but certainly fun). Two weeks’ notice is required to book a special date for Escape Ship: Captain’s Challenge; up to 10 people can be accommodated per session. Learn more by calling 757-664-1074 or visiting Nauticus.org/EscapeShip. The Hampton Convention & Visitor Bureau has won Smart Meetings’ 2016 Platinum Choice Award, which honors premier CVBs, hotels and venues in prestigious categories valued most by meeting professionals. It is voted on by industry professionals, the Smart Meetings editorial team and readers. The results appear in the December 2016 issue, reaching more than 80,000 meeting professionals in print and digital. The Hampton Convention & Visitor Bureau also won a ConventionSouth magazine 2016 Readers’ Choice Award, which is determined by meeting professionals and readers who were asked to vote on the ‘best of the best’ for meeting sites across the South. Each recipient of the award “displays the commitment to professionalism, creativity and service that they require.” The results appear in the December 2016 awards issue of ConventionSouth magazine. 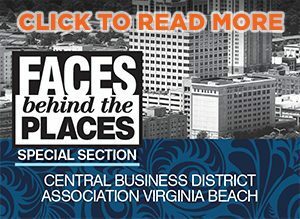 Downtown Norfolk Council (DNC) received a Merit Award for its Vibrant Spaces initiative from the International Downtown Association at the 62nd Annual Conference and Tradeshow in Atlanta. Vibrant Spaces was among 10 qualified entries in the category of Economic and Business Development. The initiative, a catalyst program, was developed to attract new vibrant businesses in addition to enhancing exiting business. Vibrant Spaces received 97 applications. To date, Vibrant Spaces has added three new businesses downtown, Muddy Paws Downtown, Prince Ink and Lamia’s Crepes in addition to awarding grants to four existing businesses for enhancements. The Mariners’ Museum is one of 206 museums in the country and three in Virginia to be awarded an Institute of Museum and Library Services (IMLS) Museums for America collections grant. The USS Monitor Center’s proposal was chosen from a pool of 548 applications. The $27,823 grant will be matched with non-federal funds and will allow the museum to purchase, install and operate a new electrolytic reduction (ER) computer monitoring system to support the conservation of the iconic revolving gun turret from the USS Monitor, housed in the USS Monitor Center’s Batten Conservation Complex. Impact 100, a charitable fund at the Peninsula Community Foundation of Virginia, held their first annual Impact 100 Greater Peninsula Give Grant Award Ceremony where they presented checks totaling $100,000 to two nonprofit groups from the Virginia Peninsula. This year, 198 women made a $1,100 donation to become either an individual or circle member of the grant-making organization. Each year, the group will pool members’ gifts to make at least a $50,000 grant to deserving charities in the categories of education, environment, recreation and conservation. The first organization to receive a $50,000 grant was the Center for Child and Family Services for its “Launch Program.” The second $50,000 grant went to Child Development Resources, which has partnered with The One Center for Autism to expand One Child’s KIDS’ Night respite program. Learn more about the organization at PCFVirginia.org/Impact-100. Images from Tara Farrell Photography (TaraFarrellPhotography.com). More than half a century ago, Alfred Dreyfus identified a need for providing accelerated, hands-on education to develop skilled technicians. Very few schools offered computer classes at the time, but the demand for trained professionals was rapidly growing. So, in 1966, he founded ECPI University—then known as the Electronic Computer Programming Institute—in Norfolk. Over the decades, ECPI has expanded and evolved to provide programs that are specifically linked to the demands of the employment marketplace. The original campus in Norfolk moved to Virginia Beach, and additional campuses opened in Newport News, Richmond, Roanoke and Northern Virginia. As time passed, six more campuses opened in North and South Carolina. Programs were also added, first in health science, then in business, criminal justice, and the culinary arts. 1. Lunch rules still apply here. If you’re inviting a person to sweatwork, you’ll need to buy that person a day pass to your gym and/or book the class you’re planning to take. 2. Don’t pick a super structured class, like yoga, Zumba or pilates, where it would be rude or distracting to try to have a business conversation. Spinning is ideal because you can sit side by side. 3. Don’t skimp on your workout, but don’t go overboard either, especially if you’re just getting back into your routine. No significant business deals can go down if you—or your networking buddy—are too out of breath to talk. 4. Didn’t get to bring up all the points you wanted to during the workout session? Invite your colleague or client to join you for a healthy salad or smoothie afterward. Old Dominion University recently opened the Kate and John R. Broderick Dining Commons, a 39,000-square-foot, all-you-can-eat facility that provides a restaurant-style environment. Inside, students can choose from an array of made-from-scratch options like sushi, Brazilian-style churrasco grilled meat, gourmet, thin-crust pizza, a noodle bar, hibachi grill, homemade tortillas and salsa bar, tapas from around the world and an assortment of pies, cakes, cookies, doughnuts and bread made by in-house pastry chefs and bakers. More than just a place to eat, the new dining hall will serve as a place of fellowship and connectedness for students, as President Broderick explained at the facility’s opening. Learn more at OldDominion.CampusDish.com. Norfolk-based 80/20, a software agency that provides disruptive software and consulting to enterprises and well positioned startups, has been selected by ARCSys to provide software development and product management for their flagship product, ACL Calculator. ARCSys provides sophisticated quantitative and qualitative analyses to their enterprise clients to mitigate loan and lease loss risks while complying with regulatory requirements and GAAP accounting standards.